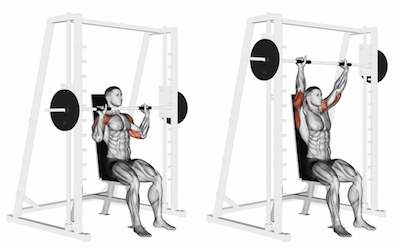 Take position in the Smith Machine with back pressed against an upright bench. The bench should be set up just short of 90 degrees to allow the bar to pass in front of your nose. Place your feet flat on the floor and take a medium-width grip on the bar. Extend the arms up, removing the bar from the hook and settle yourself for 2 seconds before you commence. This is your starting position. Lower the bar over 1-2 seconds as you breathe in. The bottom of the movement is when your palms are level with your shoulders. Reverse the movement by raising the bar over 1-2 seconds as you breathe out and return to the starting position.